The Namibian High Commissioner to Nigeria and Cameroun, Dr. Peingeondjabi Shipoh has underscored Nigeria’s contributions to the liberation struggles in most parts of Africa. Dr Shipoh, who is also Permanent Representative of Namibia to ECOWAS and Ambassador to Chad, lauded Nigeria for its role, particular in the Namibian liberation struggle through various forms of assistance. These, he disclosed, include the education of young South West African Peoples Organization (SWAPO) students. Dr. Shipoh, who schooled in Nigeria, made these recollections while speaking with newsmen on the courtesy call of President Hage Geingob on Nigerian President, Muhammadu Buhari. The Namibian President, he stated, is in Nigeria as guest at a seminar event and would be departing to Lagos, venue of the event, after his courtesy call on President Buhari. President Geingob’s Jet landed at exactly 13.50 hours Nigerian time in the Dr. Nnamdi Azikiwe International Airport, Abuja. 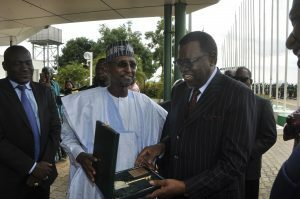 He was received upon arrival by the Nigerian Foreign Affairs Minister, Mr. Geoffrey Onyeama and was presented with the key to the City of Abuja, by the FCT Minister, Malam Muhammad Musa Bello, conferring on him the Honorary Citizenship of Abuja. Upon receiving the key, President Geingob thanked his Nigerian counterpart for his kindness at the occasion which highlighted the friendship between Nigerians and Namibians. Elected in March, 2015, President Geingob’s first visited Nigeria during the inauguration of President Buhari. 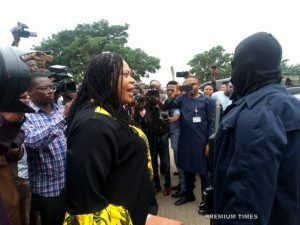 “This is his second visit to Nigeria and it is a private one,” the High Commissioner stated. Dr. Shipoh, who attended the Federal Government College Enugu, under a UN arrangement, presented himself as a proud alumnus of the Nigerian high school system. He noted that the long standing relationship between Nigeria and Namibia has manifested in various partnerships – political, economic and cultural. He noted that a major fruit of this cooperation is the commencement in July 29, this year, of commercial flights by Namibian Airlines between Lagos and Namibia. “We now operate four commercial flights weekly from Lagos to Windhoek,” he revealed.